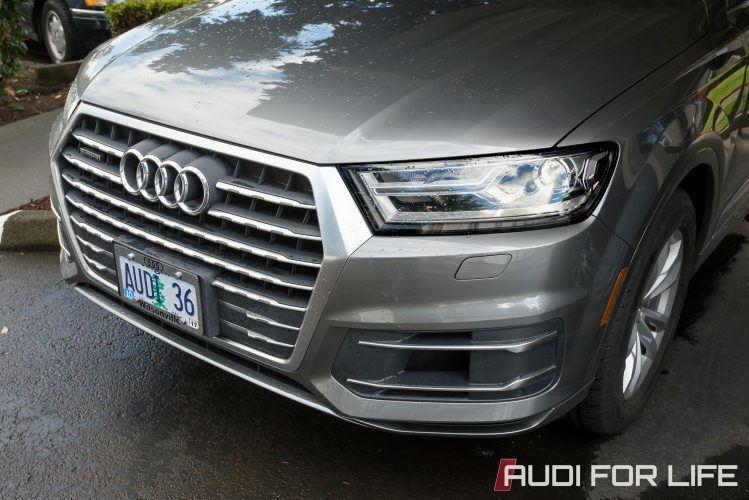 Back in December 2015, I got my first good look at the all new 2017 Audi Q7, when it was at Audi Wilsonville for brand specialists to learn about the new crossover, especially the new technology that is packed in. Unfortunately, I didn’t have time to take a spin in the Q7. Jumping ahead to late August, I was heading up to the Seattle area to be a photographer for a summer picnic for a radio show-turned-podcast, Too Beautiful To Live. In addition to bringing up photography equipment for the event, I was also bringing up several items and food dishes for the picnic. All of that would have been a tight squeeze in the S5, but was grateful that Audi Wilsonville provided a 2017 Audi Q7 for a couple of days. Although the Q7 was not as handsomely equipped as the one that I got to see last December, but it had everything that I wanted for what would be a long day’s drive up to Woodinville, Washington. I made plenty use of the CarPlay integration that came with the MMI navigation plus package to listen to podcasts and get directions to where I needed to go. The Q7 was not equipped with the über fancy Virtual Cockpit display, but I didn’t completely miss it. The reason why I didn’t really miss it was the CarPlay integration only displays the navigation map and user interface on the main MMI display, not on the Virtual Cockpit display (when equipped). 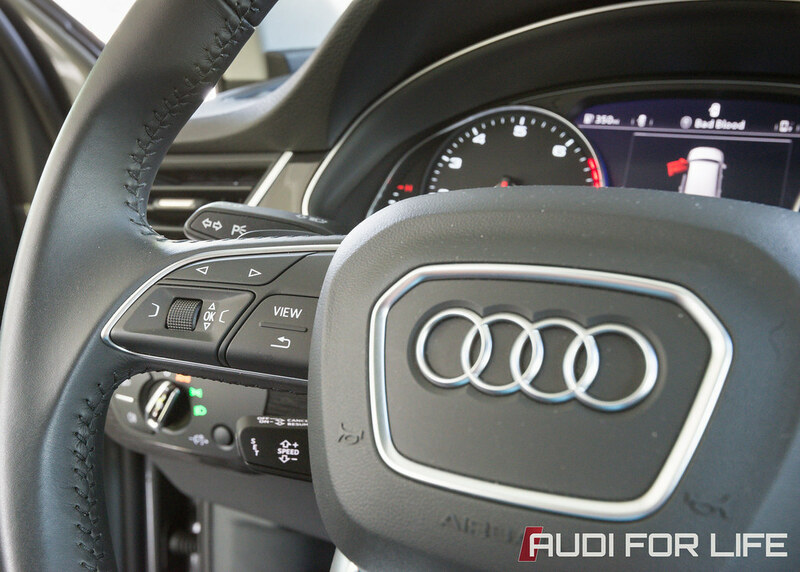 For most of the trip up, I had set Audi Drive Select on Comfort or Individual, with the individual settings of: Engine set to Auto or Dynamic and Steering set to Comfort. When I needed to really open up the tap to the supercharged 3.0-litre V6, I would tap the gear selector to put into S mode and stomped on the accelerator. 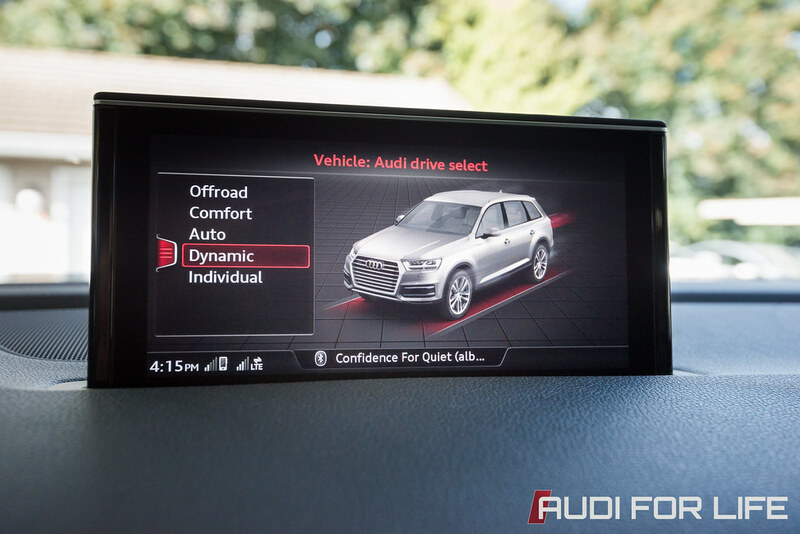 Every single time I stepped on it, I was surprised at how quick and nimble the new Q7 felt. Although the new Q7 lost a couple hundred pounds when it changed over to the MLB Evo platform, the Q7 still weighs in at roughly 5,000 pounds… and that’s before I climb in and add a good amount of weight. The other piece that helped me not think about the size and heft of the Q7 was the light, yet numb, steering. 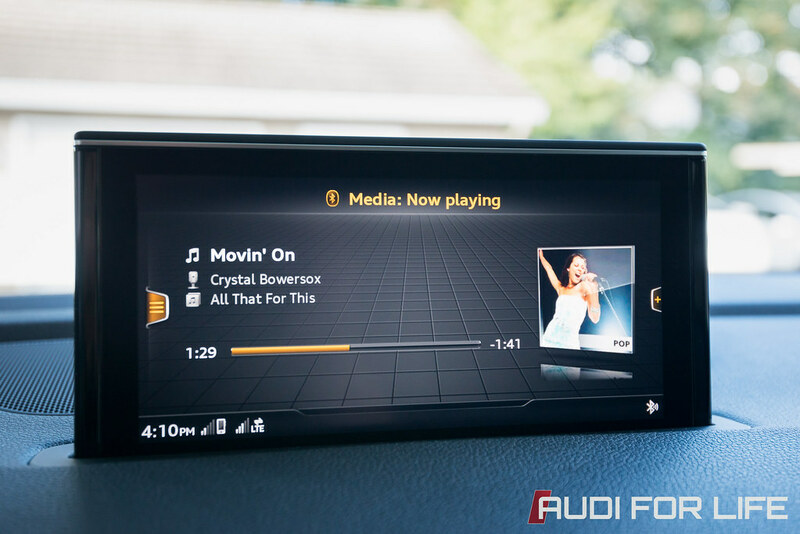 Even with steering set to Dynamic in Audi Drive Select, it was still easy to maneuver through tight parking spots and around various road construction obstacles. Over the course of 400 or so miles that I put on the Q7, with about two-thirds of miles racked up being highway miles, I was able to average around 23 MPG. Not bad for a three-row, 5,000 pound crossover putting out 333 horsepower and 325 lb-ft of torque. Those power figures are basically unchanged from the previous generation Q7 3.0T S-Line. I may complain slightly about the relatively numb steering feel of the Q7, it was still much better than the Infiniti QX60 that I had the pleasure of renting while on a recent business trip. 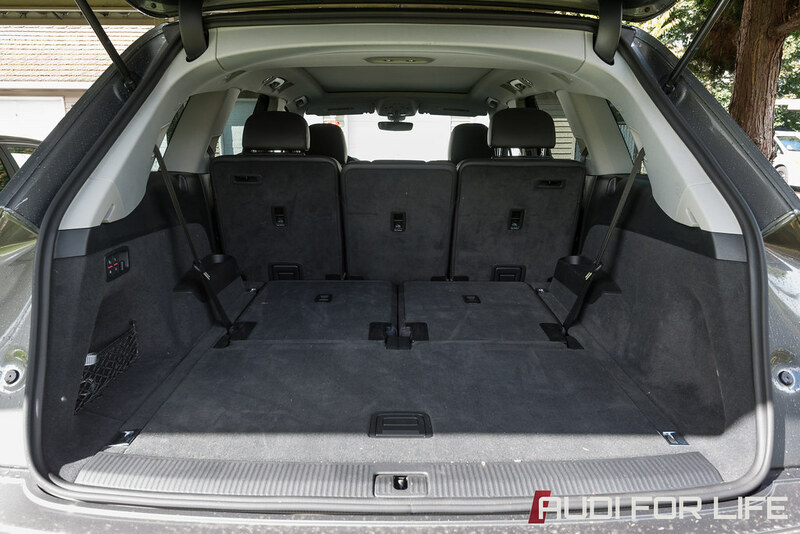 Even though the Infiniti QX60 and the Audi Q7 can be considered competitors, the new Q7 trumps the QX60 in basically every aspect; with, the only possible exception being price. The QX60’s steering felt like it was ripped out of a racing arcade game from the late 90s. A lot of enthusiasts love to sneer at CVT gearboxes for various reasons and the one in the QX60 was horribly slow everything, including changing between “gear ratios” in manual shift mode. Don’t get me started on the Eco mode. The infotainment system felt like it was pulled from a parts bin from a car sold at half the price; much less, the driver information display in the instrument cluster setup felt disjointed and the screen came from a Game Boy Advanced. 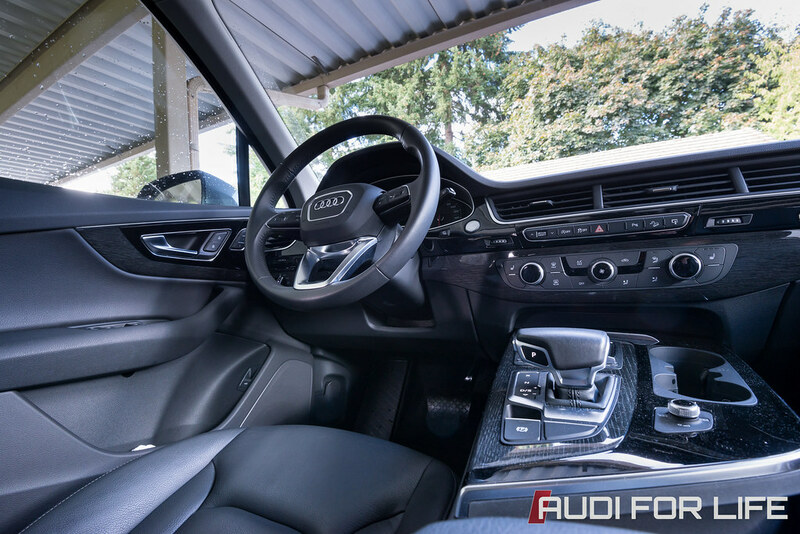 Even with it’s minor worts, the new Q7 may be a little bit bland in terms of exterior design, but the gorgeous interior, near-futuristic MMI system (and available Virtual Cockpit), and the venerable and extremely capable drivetrain makes the QX60 look like and drive like a half-arsed attempt at a crossover. I want to thank Audi Wilsonville for letting me drive the 2017 Audi Q7.